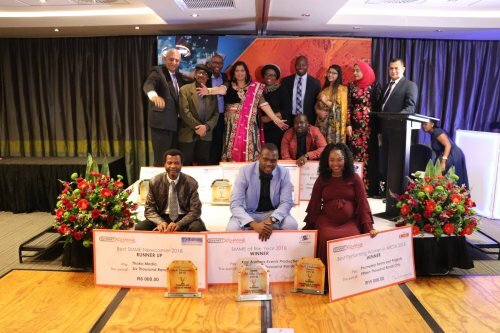 A glittering MICTe SMME Awards dinner was held by SmartXchange on 21 November 2018 at Coastlands Hotel, Musgrave. These awards saw the attendance of dignitaries from the eThekwini Municipality, founders and funders of SmartXchange, corporate partners and the SmartXchange SMME's. The SMME's were ever so intrigued in receiving Mr Sbu Shabalala's keynote message as he shared his journey which has taken his company, Adapt IT Holdings, from a 14 square metre office at SmartXchange, as a SmartXchange SMME, to a 18 000 square metre office space in Johannesburg. SmartXchange management and funders remain pleased in witnessing the fruits of their commitment towards growth of small businesses, Sbu being testament to this. It was therefore a proud moment for them to share in the return of one of their own after 13 years of having graduated from the incubator, returning with the great success story of his company being listed on the JSE and being the 150th richest South African IT Executive in the year 2015. Sbu commended the great strides being done by the currently incubated SmartXchange SMME's and shared in the highlight of the evening, which was the presentation of the Awards. The winner for MICTe SMME of the Year 2018 is Kasi Brother Productions with the runner up being Msalwa Productions; winner for MICTe Women of the Year 2018 is Phumelela Farms and Projects with the runner up being Enspired Women Magazine; winner for Best Newcomer 2018 is Enspired Magazine with runner up being Thako Media. SmartXchange extends a heartfelt thanks to Mustek, 3c Technologies, IT Master, Liquid Telecom, Centre of Fine Arts and Animation, Technodyne Group and Adobe for the sponsorship of prizes.